MSE Creative Consulting Blog: Tornado Danger Forecast Elevated Further! 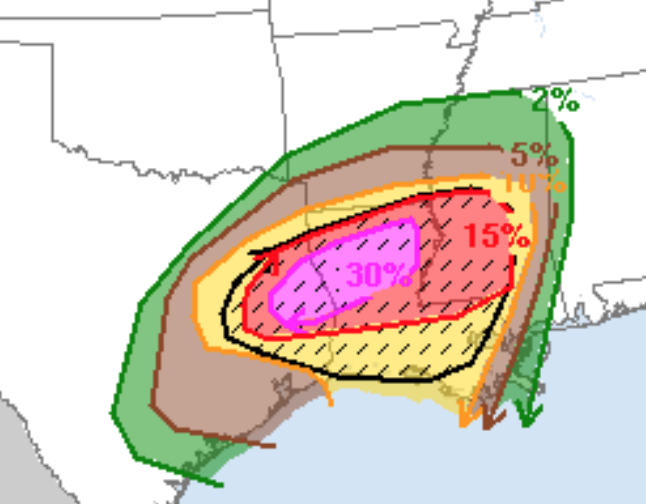 If you'll recall from earlier this morning, the maximum tornado risk was a high 15%. Now, it is an extremely high 30% from east Texas to northeast Louisiana (around Monroe). The 15% area has been extended east into central Mississippi (including Jackson). The hatched area is where violent tornadoes could occur. This has been extended to New Orleans. The bottom line of all of this is that there will likely be violent tornadoes accompanied by very large hail and damaging winds. Scroll down for the list of preparatory measures. Make sure you have two ways to warnings for your area in addition to television. If you are unfamiliar with tornadoes and tornado safety rules, go to AccuWeather Ready now. Don't wait until a warning is issued.